There are a few things you need to know about the pictures we're going to show you at the end of this post. 1. 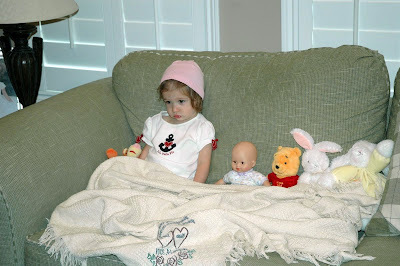 Ava loves wearing hats: We recently posted about this on our blog here. 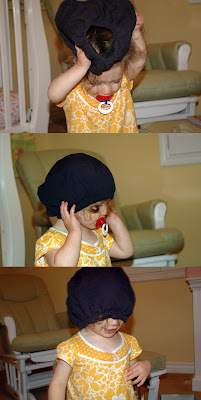 However, should you require further evidence of Ava's love for cranial apparel, here are some pictures of her trying to wear her bloomers as a hat. 2. Ava likes watching television: Yes, we are horrible parents for indulging her TV-watching habit, but as revealed here, she's got us (or at least Larry) wrapped around her finger. And yes, when she's watching one of her shows on television, she tends to have that spaced-out look on her face (you know, that look kids get when their brains are turning to mush due to under stimulation). 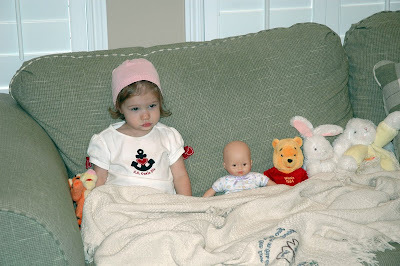 So one particular morning Krista came back into the family room near the end of the program and found that Ava had apparently decided to make arrangements for some friends of hers. Again we remind you that we had no part in the display you see here. All we did was take the pictures. That's great. Man she looks older in this picture. That is so cute...what a smart little girl!! Guess her friends like the show too huh!! I know this is really random, but somehow my mom came across your blog while looking for a byu cheerleading outfit for my neice--do you happen to have any idea where you found the outfit at? She is trying to find a cute blue one but all she can find is pink! Thanks! We got Ava's BYU cheerleading outfit at the BYU bookstore. That is so cute! She looks adorable in hats! It was so good to see you guys last night.